A ‘Hasu’, lotus flower, is thought to be the ideal of the Buddhist because the flower is prettily in bloom without stains in a dirty and muddy field. The Buddhism teaches people should live like a lotus, having a beautiful and pure mind, even though this world is filled with social vices. This is a reason why almost every temple has a pond with lotuses growing in it to indicate the right way of their life to the believers. Strictly speaking, not only temples but also shrines are equipped with the similar ponds as the traces that temples and shrines were syncretized by the end of the 19th century. 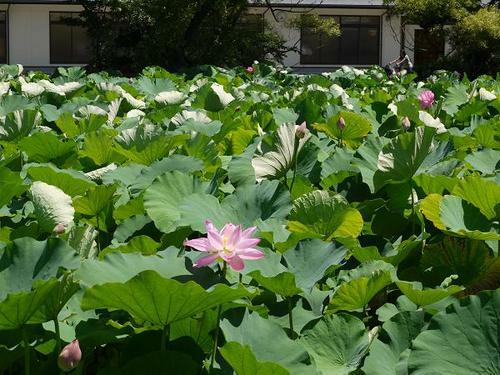 Apart from religious meaning, there are many lotus ponds in Japan to harvest lotus roots which are used for the ingredients of various kinds of Japanese peculiar dishes.